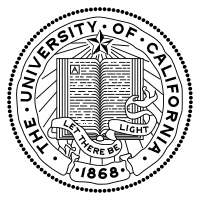 The University of California (UC) is a public university system in the U.S. state of California. It was founded in 1868 in Berkeley, California. Its tenth and newest campus, UC Merced, opened for classes in fall 2005.— Excerpted from University of California on Wikipedia, the free encyclopedia. This page was last edited on 29 March 2019, at 06:05.